I'm stunned. I'm angry. 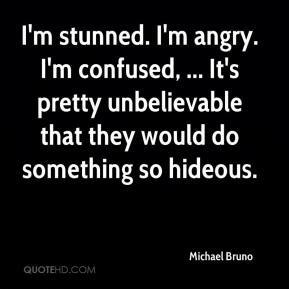 I'm confused, ... It's pretty unbelievable that they would do something so hideous. 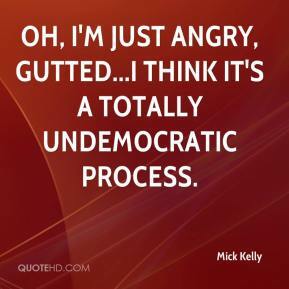 Oh, I'm just angry, gutted...I think it's a totally undemocratic process. 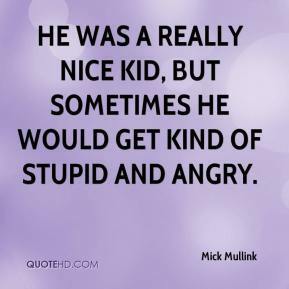 He was a really nice kid, but sometimes he would get kind of stupid and angry. That made a lot of people angry, which is the problem they've got. Some of them are angry. 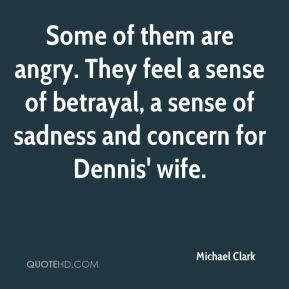 They feel a sense of betrayal, a sense of sadness and concern for Dennis' wife. Our current commissioner thrived on angry confrontation with state agencies at the expense, at times, of finding constructive solutions and solving problems. 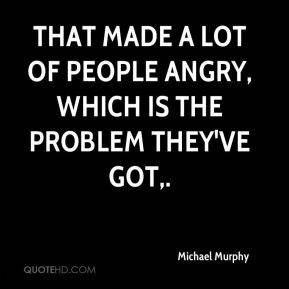 I strongly believe in civic responsibility, with an emphasis on civility, and have never had any qualms to standing up to what I believe is bad government. 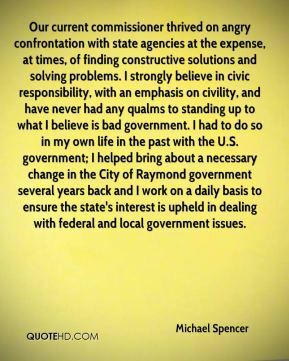 I had to do so in my own life in the past with the U.S. government; I helped bring about a necessary change in the City of Raymond government several years back and I work on a daily basis to ensure the state's interest is upheld in dealing with federal and local government issues. 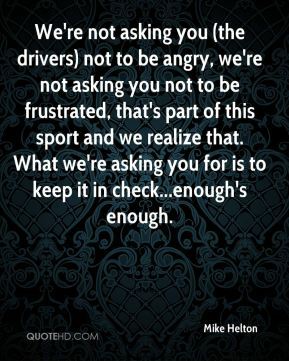 We're not asking you (the drivers) not to be angry, we're not asking you not to be frustrated, that's part of this sport and we realize that. What we're asking you for is to keep it in check...enough's enough. Live free or die! 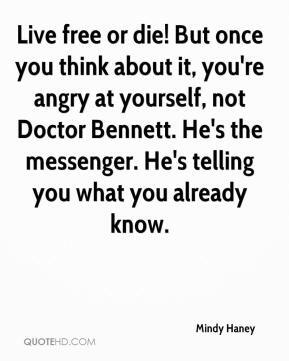 But once you think about it, you're angry at yourself, not Doctor Bennett. He's the messenger. He's telling you what you already know. What really makes me angry is he told the truth. How can you punish somebody for that? I have been in this lady's shoes. I've been angry and left his practice. I mean, in-my-car-taking-off angry. 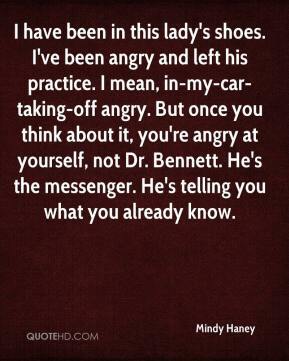 But once you think about it, you're angry at yourself, not Dr. Bennett. He's the messenger. He's telling you what you already know. Other than the fact that everyone should be a little angry about the whole thing, no. 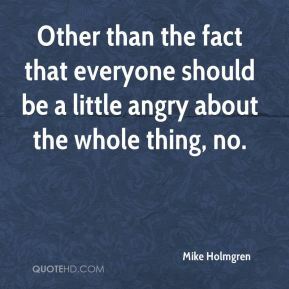 I'm learning not to get so angry. 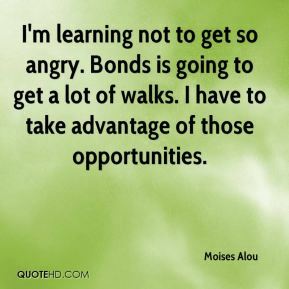 Bonds is going to get a lot of walks. I have to take advantage of those opportunities. We had better be angry. We can't feel sorry for ourselves. 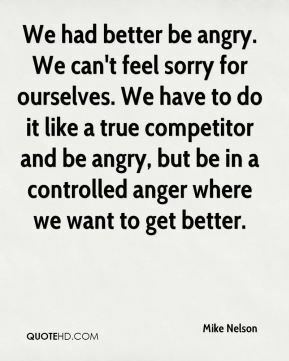 We have to do it like a true competitor and be angry, but be in a controlled anger where we want to get better. 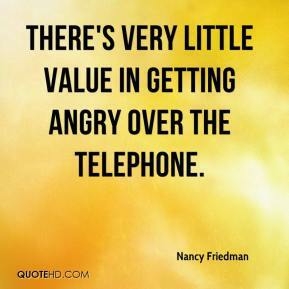 There's very little value in getting angry over the telephone. 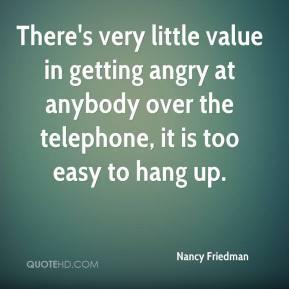 There's very little value in getting angry at anybody over the telephone, it is too easy to hang up. When she didn't come through the door, I was sad, angry and confused. 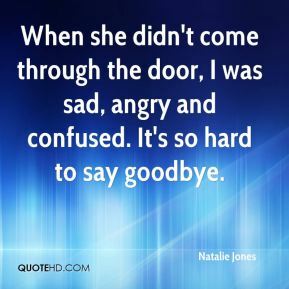 It's so hard to say goodbye. 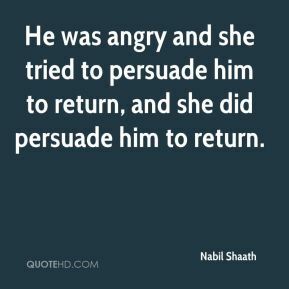 He was angry and she tried to persuade him to return, and she did persuade him to return. 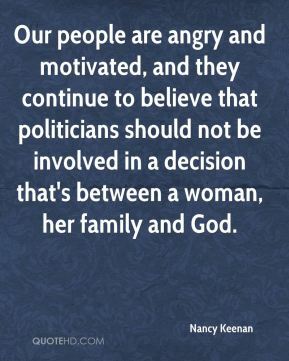 Our people are angry and motivated, and they continue to believe that politicians should not be involved in a decision that's between a woman, her family and God. 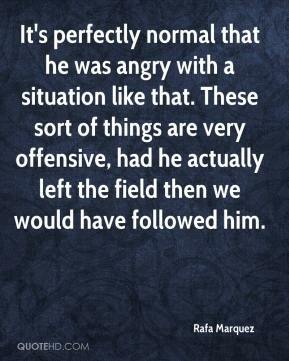 It's perfectly normal that he was angry with a situation like that. These sort of things are very offensive, had he actually left the field then we would have followed him. It's understandable that he got angry. These things cause a lot of offense. 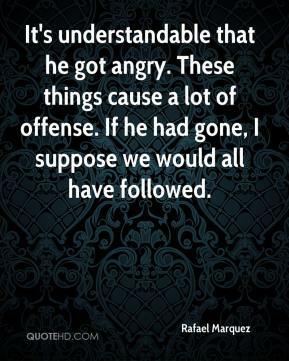 If he had gone, I suppose we would all have followed. He's angry when he leaves. His aggression has been building on each trip he makes because he can't find Paul Alamo. 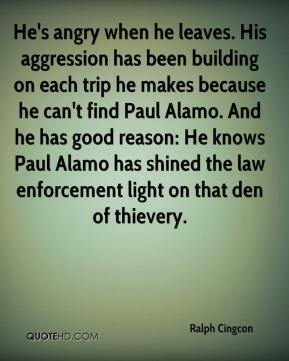 And he has good reason: He knows Paul Alamo has shined the law enforcement light on that den of thievery. 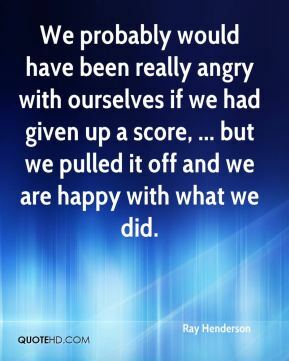 We probably would have been really angry with ourselves if we had given up a score, ... but we pulled it off and we are happy with what we did. 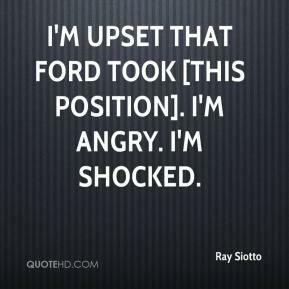 I'm upset that Ford took [this position]. I'm angry. I'm shocked. 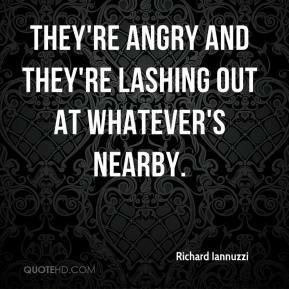 They're angry and they're lashing out at whatever's nearby. 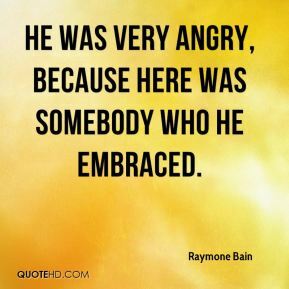 He was very angry, because here was somebody who he embraced.